As you've no doubt noticed from the last few entries in this series, the waning days of 1988's summer didn't feel quite like the blockbuster season we now see extending all the way up to September. 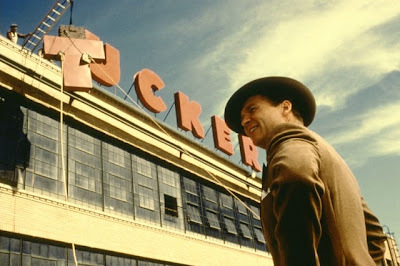 Opening on August 12, 1988, Francis Ford Coppola's Tucker: The Man and His Dream was the kind of prestige project you'd more likely associate with awards season. For Coppola, it is among his most personal films, not only because it spent the longest time in gestation, but because it's the closest the filmmaker has ever come to a confessional about the professional betrayals he'd contended with in his career, and the virtues and flaws of mounting a creative collaboration. Excellent review of this underrated film. Yes, it's clear that Coppola identified with Preston Tucker, the eternal underdog (as he saw it), someone who needed to rock the boat to succeed. I've memorized that bit of dialogue about "catching one's dreams," as it's one of my favorites from any film. To be able to write something like that- wow! I also love the business about Howard Hughes, from Dean Stockwell's subtle performance to the marvelously eerie sets where Hughes conducts his business. His dialogue is purposely confusing, as if to suggest his mental condition as being slightly over the edge. And how beautiful is the courtroom sequence shot and lit by Vittorio Storaro?